Maa Kamakhya Devi temple is one of the strongest Shakti Peeth among 9 shakti Peethas of hindu goddesses Durga, according to hindu mythology. Shakti Peethas are the places of worship consecrated to the goddess Shakti or Goddess Sati or the wife of Lord Shiva. Kamakhya Devi temple in Nilachal hills of Guwahati, Assam anually clebrated Ambubasi Mela during the monsoon season to celebrate menstruation course of goddess Kamakhya. It is widely believe that during the Assamese month of Ahaar, around the middle of June Devi Kamakhya, the Mother Shakti, goes through her annual cycle of menstruation during this time stretch. During these three days the temple remains closed. It is also believed that during the monsoon rains the creative and nurturing power of the 'menses' of Mother Earth becomes accessible to devotees at this site during the mela. In Assam it is believed that the earth becomes impure during this time. No farming work is undertaken, and daily worship and other religious performances are suspended for the duration. In assamese it is called Haat Loga. There is no idol of the presiding deity but she is worshipped in the form of a yoni-like stone instead over which a natural spring flows. Ambubasi Mela is also known as Ameti or Tantric fertility festival which last 4 day long. This mela is closely associated with Tantric Shakti cult prevalent in eastern parts of India. Even some Tantric Babas make their public appearances only during these four days. The rest of the year, they remain in seclusion. Some Babas are seen displaying their psychic powers like putting their heads in a pit and stand upright on it, standing on one leg for hours at a stretch. The Kamakhya Devi temple remains closed for three days during the mela as the believed that mother earth becomes unclean for three days like the traditional women's menstrual seclusion. During these days devotees observe some restrictions like not cooking, not performing puja or reading holy books, no farming etc, none of them cooks food at home and remain on a fruit diet. After three days the earth regains her purity, the Goddess Kamakhya is bathed and other rituals are performed. On the fourth day, the temple doors are reopened to devotees, who are allowed to enter inside the temple to worship Maa Kamakhya once again. There are two types of prasad is distributed among devotees – Angodak and Angabastra. Angodak literally means the fluid part of the body - water from the spring and Angabastra literally means the cloth covering the body - a piece of the red cloth used to cover the stone yoni during the days of menstruation. Lakhs of devotees starting from Sadhus to householders, come from all over India and the world visit this mela, and it is one of the most famous melas in all of India. 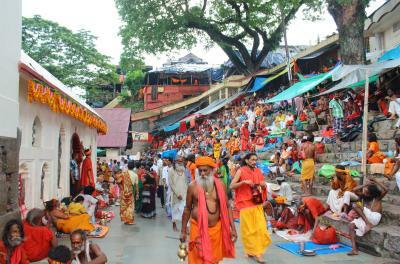 Foreigners from abroad come to seek blessings of mother Kamakhya during this mela.